5 lb. hammer in polished chrome finish. Pulls flange-type rear axles and most front-wheel drive hubs. Internal and external jaws provide a variety of combinations to pull bearings, gears and seals. Two- and three-way cross blocks and cone provide the perfect jaw configuration for most jobs. 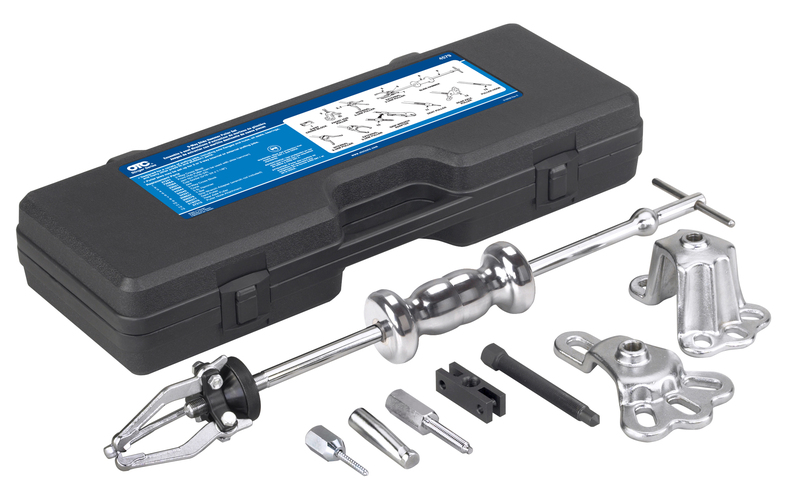 Set also includes a grip wrench adapter and a dent puller attachment for sheet metal or other unique pulling requirements. Designed for use with other OTC 5/8"-18 thread slide hammer attachments. • Always follow proper safety precautions when using pullers, available here.